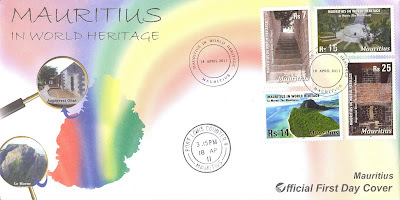 The Mauritius Post Ltd. issued on April 18, 2011 a set of 4 postage stamps on the theme: "Mauritius in World Heritage". 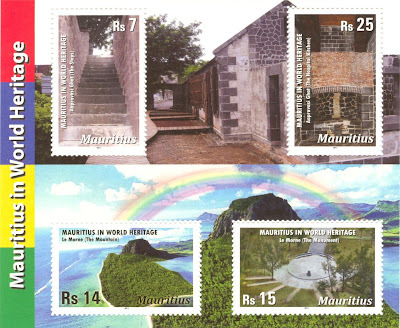 The set comprises 2 stamps depicting Le Morne Heritage Site and 2 other the Aapravasi Ghat. Le Morne is a mountainous promontory in the South West of the island of Mauritius where slaves escaping servitude found refuge. Le Morne holds great importance in the history and memory of Mauritius. It is known above all for its association with runaway slaves, engaged in their act of defiance against the system of slavery generally referred to as maroonage. Le Morne stands out as a symbol where maroons paid a high price to retain their freedom by retreating into a dangerous mountain that required confronting frightening heights and negotiating narrow passes in hazardous conditions. In extreme cases, maroons chose death over captivity. This impressive natural site also symbolises the slaves' fight for freedom, their suffering and their sacrifice, all of which have relevance, beyond its geographical location, to the countries from which the slaves came - in particular Africa, Madagascar, India and South East Asia - and represented by the Creole community of Mauritius and their shared memories and oral traditions. Slavery was officially abolished in Mauritius on the first of February 1835. Commemorations are held in the island on that special date every year. Le Morne Cultural Landscape was inscribed on the UNESCO World Heritage List in July 2008. -The Rs14 stamp illustrates Le Morne Mountain and its surrounding landscape. -The Rs15 stamp illustrates the monument, seen from the mountain, erected in the memory of the slaves and their country of origin. After the abolition of slavery, workers were desperately needed to work on the sugar cane estates as the majority of freed slaves refused to work in the fields again. That is when the British administration decided to bring thousands of indentured workers from India, mainly, Eastern Africa, Madagascar, China and South East Asia. Unlike slaves, indentured labourers were remunerated - though poorly - but there living conditions were not better. The Aapravasi Ghat (meaning The Immigration Depot in Hindi) used to accommodate indentured labourers from the time of their landing to their deployment on the various sugar cane estates around the island. The Aapravasi Ghat site stands as a major historic testimony of indenture in the 19th century. It represents not only the development of the modern system of contractual labour, but also the memories, traditions and values that these people carried with them when they left their countries of origin to work in foreign lands. The Aapravasi Ghat was inscribed on the UNESCO World Heritage List in July 2006. -The Rs7 stamp depicts the flight of 16 steps which stands as the most symbolic figure of the site. It marks the gateway through which thousands of indentured labourers hailing from diverse parts of the world first laid foot before going through the immigration process to seek another future. 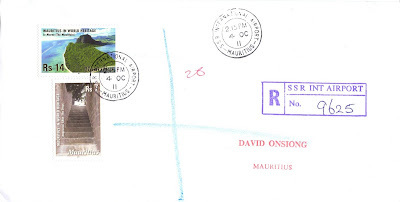 -The Rs25 stamp features the hospital kitchen located within the hospital block and where medical instruments were sterilised. Basic medical examinations of the indentured labourers were conducted in the hospital block. The MPL also released a souvenir sheet consisting of the 4 stamps.. Printer: BDT Intl. Security Printing Ltd.